In case you didn’t know, I am a cookie monster. And I promised to post more cookies on this blog. So here goes: Monster Cookies! Monster cookies are the epitome of childhood for me. 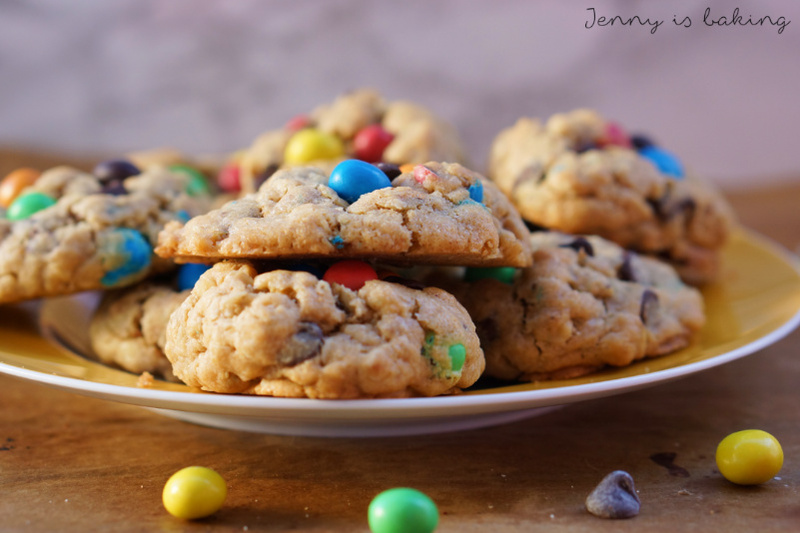 M&Ms, chocolate chips, peanutbutter, and oatmeal. Can’t beat that. And as children are usually too impatient and because these do need to chill for a little bit so that you can form them into balls, I will keep it short today. Just go and make them. Cream the butter with the sugars until fluffy and creamy, takes a few minutes. Add the eggs, peanut butter and vanilla extract and cream for another few minutes. Add flour, baking powder and baking soda and mix on low until combined. 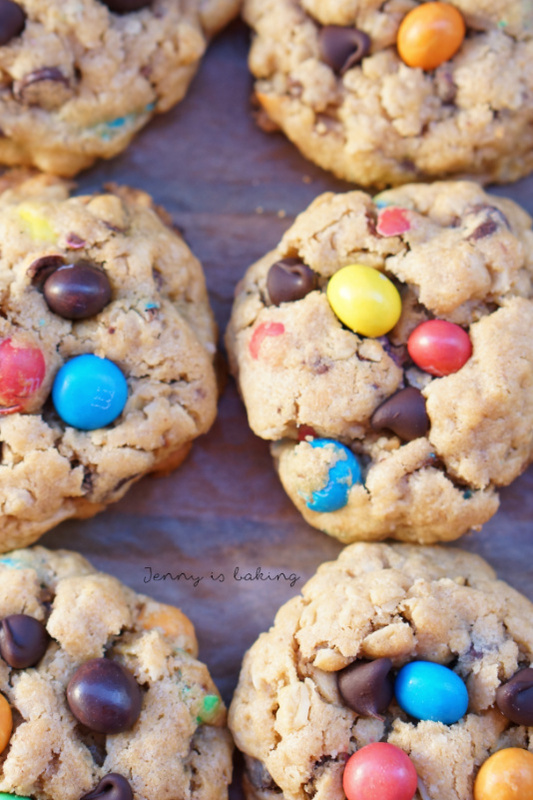 Add the oats, M&Ms and chocolate chips on low until combined and let chill for about 30minutes and it is possible to form the dough into balls. Line a baking sheet with parchment paper and preheat oven to 180 degrees Celsius. Take two tablespoons per cookie and roll into a ball. I press them down slightly as they don't spread much. Place about 9-12 cookies on a baking sheet and bake for about 12 minutes, the center will still look very soft. 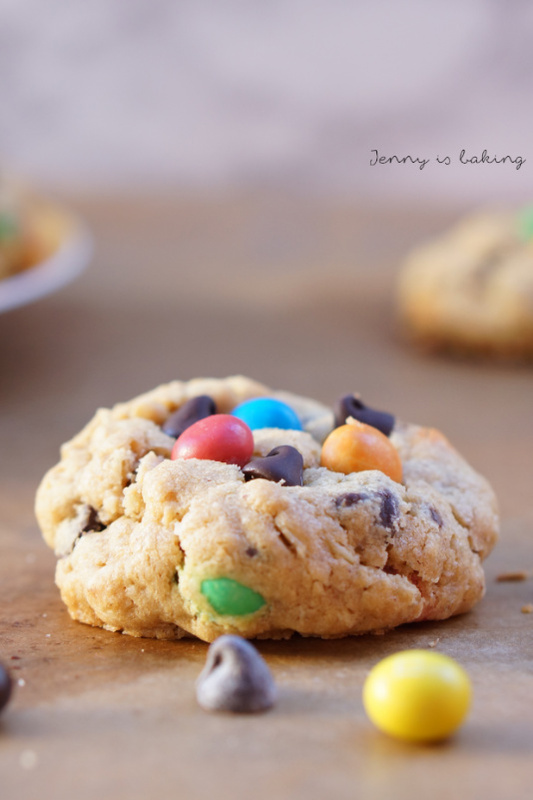 If desired, add more chocolate chips and M&Ms for nicer looks and while the cookies are still soft. You need to be sure that the butter and egg are at room temperature. This is really important. If you forgot to take out either on time, place the egg in warm water for a few minutes and cut the butter into 4-5 pieces. Cover the butter pieces with a mug you previously had filled with boiling water. Obviously you should discard the water before placing the mug on the butter pieces. So which cookie represents your childhood best? I am also sharing these cookies at the link party Fiesta Friday, which is hosted by Monika from Everyday healthy recipes and Laurena from Life Diet Health. Yay! I’m a cookie monster, too! And I absolutely love these – they look happy!😁 Happy FF, Jenny! Ha, they should look happy!